The photos to the left show some examples of closed coiling. The photos shown are of fairly complicated projects, you will learn how to do a basic 2 or 3 color design. Once you have learned the basics, complicated designs are not that difficult. Students should bring a prepared gourd bowl. The gourd should be no larger than about 6-7" wide - (you may use a larger bowl but the project will take you a long time.) Prepare the bowl by cutting off the top and cleaning the gourd thoroughly inside and out. DO NOT drill holes in the gourd, we will do that in class. Optional: You may decorate or paint the bowl if desired, these steps should finished prior to class. 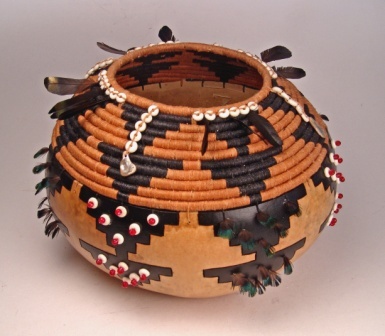 Depending on the size of your gourd bowl, the amount of woven rows, and your own skill level, you may or may not complete the project in class. You will be far enough along that you can easily finish the project at home. The best part is that the class is quiet and there are lots of opportunities to visit with your fellow students while you work! You will be provided with a written tutorial, basic core material and a pair of weaving needles (these are large eye, blunt point needlepoint needles - you may also bring your own if you want extras.) Additionally, each student will need 2-3 spools (depending on how many colors you want to use) of 4 ply waxed linen thread. Contact me if you need to know about supply sources. Vendors will have waxed linen at the Wuertz festival. A color chart is below. Bring to class: A sack lunch, prepared gourd bowl and scissors. Color chart for waxed linen thread. Using only one color, a typical bowl could be completed with one spool. However, you should have at least two colors to totally understand the technique. NOT SHOWN: Green, Magenta, & Lemon Yellow Each spool contains about 90-100 yards. This piece was woven with natural, black, and accent colors.